For most people when they retire life will have many pleasures and having the time to enjoy them is very precious. Travel and exploration become part of the way of life for many. Since my previous memory from Florida in 2016, at the age of 63, I have now joined the world of the retired having decided that the time was right to leave a 35 year corporate career behind and live life for myself and my family. For me this means a world of opportunity to not only spend more time with my wonderful family but to also follow my passion for adventure and exploration through the extreme sports I have devoted a lifetime to. I could think of no better way to start than an adventure of challenging my personal limits and exploring one of the most spectacular regions of the world, The Alps, and so The Alpine Challenge was born, to cross the Alps from France to Slovenia in my camper van with my Downhill Racing Bikes on the pack, racing and riding in some of the most iconic Downhill MTB events and locations on the planet. I am part way through the journey as I write this and I have completed successfully three of the challenges I set myself. 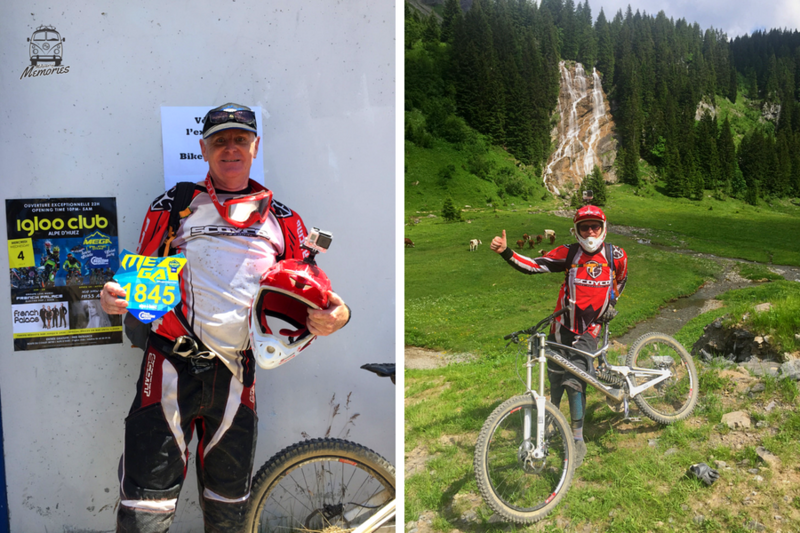 The first was four days of mountain biking on the Passportes du Soleil MTB Festival based out of Chatel, in the Haute Savoie region. The Port du Soleil region, easily reached from Geneva, is more associated with winter sports, but in the summer a magical kingdom comes alive with views dreams are made of and some of the best mountain bike terrain in the world to enjoy, all serviced by the ski lifts which transport you and your bike to the highest summits. Over the four days over 150 kilometers was ridden and the experience would set me up well for my second event, The Megavalanche Downhill Race in Alpe D’Huez, three hours to the south. Extreme is too soft a word to describe The Megavalanche event and for the first time in many years I was more than nervous, I was scared, very scared. The race runs from the top of the Pic Blanc Glacier at 3300 metres for 34 kilometres all the way to the village of Allemont at 700 metres, down the glacier and over some of the toughest and most dangerous mountain bike terrain in the world. It would be the greatest challenge of my life so far. I survived, but not without incident, crashing several times, very battered and bruised, but nothing broken, which was just pure luck. To relax and wind down, the following day I completed my third challenge, to summer ski on the glacier at Les Deux Alpes. The locations these events take you to are what makes them so special and the only way to really capture the reality is to visit yourself, though maybe without such extremity! Next time I will be exploring The Lauterbrunnen Valley in Switzerland, a stunning location and the European capital of BASE Jumping. This memory belongs to our Passenger Peter Hayes (@hayes1955) . All the pictures belong to Peter's personal archive. To know more about our Passenger Peter Hayes, click here.